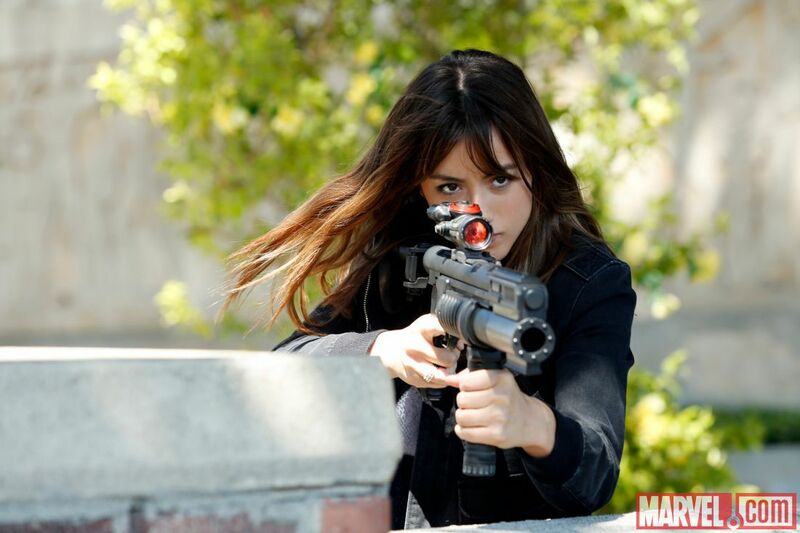 Agents of SHIELD has an amazing opportunity that its movie counterparts don't: exploration. You can't explore consequences of the world in a movie, you just don't have time. In TV's format, however, week after week you're able to delve deeper into the world and flesh out the mythology. In the first season we got bits and pieces of it. AIM, Thor, and Hydra definitely changed things, but their impact felt a little diluted. I mean, look how much things change after a disaster like 9/11. The Attack on New York in The Avengers was like double that. SHIELD almost nuked New York for Odin's sake. Even though the show took place a year or two after, you'd think it'd be more of a conversation piece. Especially since most of the show deals with the organization directly involved in it. Where are their versions of Truthers? Where are the scenes, or even a discussion, of a devastated New York? Stark helping the clean up? People who lost love ones in the battle? No, nothing. Just artifacts of aliens and life is back to normal. [caption id="" align="aligncenter" width="446"] Oh this? Yawn. Aliens. [/caption] This next season will deal with the fallout of Captain America 2 and SPOILERS: the destruction of SHIELD by a Hydra cell. That's a huge deal for that universe! Huge! That's like four Watergates and at least a dozen Iran Contra Affairs rolled into one! Imagine if the NSA fell to pieces because a KGB cell inside it failed to take over the Presidency. THEY WOULD NEVER STOP RUNNING THAT STORY. We need to see some of that fallout, not just with the team, but the world as a whole. We got a little taste towards the end of last season, but it has to play largely in the next. How do people treat SHIELD now? Does anyone trust them? Can they? What about the US' actual government? So many questions, and unlike last season I hope we get some answers. More than answers, I hope we also get more comic book characters. Arrow is awash with comic book cameos, and it makes the lack of such in Agents that more glaring. I love that they're introducing original characters, I do, but I still yearn to see some favorites on the small screen. [caption id="" align="aligncenter" width="153"] Yeeessssss[/caption] Is it too much to hope for a Taskmaster or an AIM scientist in a yellow jumpsuit? I understand it's probably a decision straight from the Mouse, an aversion to deviating from the movies for fear of alienating an audience, but perhaps with the eventual success of last season and the powerhouse profit of Guardians of the Galaxy, they'll be free to add in more from Marvel. The first season felt a lot like one giant set up. They had to get all the pieces in the right place, set up the right situations. This was felt nowhere more than the villains. Not that the show didn't have its villains. As a monster-of-the-week program, it definitely did, but they were quick one offs. We very rarely had an over arcing villain. Three in total? One of whom, Quinn, was an original creation, and the other, Garret, wasn't really much like the comic book character he was based on. Which is fine, but as a comic book show there's a certain expectation to feature comic book villains. We had, what, one good comic book villain payoff that actually occurred? Deathlok? Sure, Blackout was there, but it was a one and done monster-of-the-week deal. Not really what you'd call a "payoff". Take Graviton. They set him up early in the season in a pretty effective way, nothing that would catch viewers totally off guard. The payoff? Didn't happen. They even brought "him" back later in the season, and still did nothing. They then did something similar with Blizzard. Yes, I expect they'll be back this upcoming season, but it seems like a deflated payoff. A tease. [caption id="" align="aligncenter" width="319"] Not this Blackout for those confused. It's ABC after all. [/caption] I'm not saying season two shouldn't set things up for season three, I'm saying that we need than a couple comic book payoffs. It's one of the better things Arrow does right! It's a payoff for not just comic book fans, but also fans of the show who have just been following along. If you set up a villain early on, please, please don't make us wait a year and a half for the payoff. Is there really any question that Inhumans will be apart of the MCU? Or that Skye is probably one of them? Maybe. I wouldn't put anything past them, there were some decent twists last season. But in fairness, the evidence for Inhumans are stacking up... Skye high... Regardless, I hope we see Inhumans introduced in some way this season. Maybe just the beginning, just a kernel of the idea. Something they have to solve, a mystery to uncover. After all, it's a millenia-old culture virtually unknown to the rest of humanity. Talk about a season arc! Skye will most likely now be able to secret agent her socks off, but her powers remain a mystery. With this hopeful investigation into Inhumanity, it would be great to see the realization of Skye's power. Maybe as a season finale, sure, but something. A character who felt mostly useless last season could do with a power boost. [caption id="" align="aligncenter" width="422"] "No... no Skye--SKYE! Look into the scope--Christ--INTO THE SCOPE! "[/caption] But what do you hope to see? The fallout with Fitz and Simmons? Ward back on the team? Resolution to Phil's weird vision? Let me know in the comments below!